Figure 1. 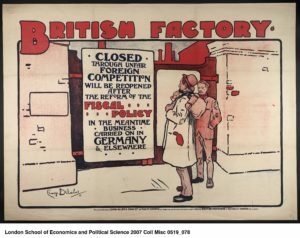 Lithograph showing two British workers standing outside a closed factory, with a sign on the gate denouncing foreign competition and recommending the reform of fiscal policy. In this section, we will segue from discussing government budgets, per se, to discussing fiscal policy. Recall that fiscal policy is the use of changes in government spending and tax rates to influence the path of the macro economy. Every federal budget reflects some fiscal policy. Fiscal policy approaches range from passive to activist. In this section, you will use the AS-AD model to help you understand how governments use fiscal policies to fight against recession and inflation, and also to promote economic growth.